Touch of Faith MinistryThis is an evangelistic ministry with the focus on reaching all of God's people with the saving power of Lord Jesus Christ. Origin of Evil: Where Did Sin Come From? Death: What’s the real story? LAW vs GRACE: Does one cancel the other? Ordination of Ellen G. White? All over the world, many faithful Christians go to worship every Sunday. Yet, no biblical command can be found for worshiping on that day. Aren’t Christian’s commandment keeping Bible readers? How is it that the majority of the Christian world is keeping something that the Bible does not support? 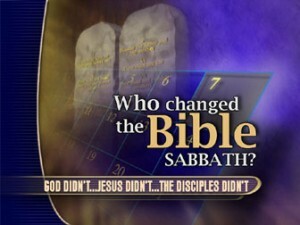 Who changed the Bible Sabbath? NOTICE: This is in the “new heavens and the new earth.” The Sabbath will continue in heaven. NOTICE: Jesus kept God’s seventh day Sabbath just like the Jews. Ezekiel: “Her _______ have ________ my law, and have profaned mine holy things: they have put no difference between the holy and profane, neither have they shewed difference between the unclean and the clean, and have ____ their eyes from my _________, and I am profaned among them.” (Eze. 22:26). The only power that has claimed to change God’s Sabbath is the Roman Catholic Church. The first historical references to the observance of Sunday by professed Christians occur in the Epistle of Barnabas (ch. 15) and in Justin Martyr’s First Apology (ch. 67), both dating from about A.D. 150. Both denounce Sabbath observance and urge that of Sunday. “But the Church of God has in her wisdom ordained that the celebration of the Sabbath should be transferred to “the Lord’s day.” – Catechism of the Council of Trent (Donovan’s translation 1829), part 3, chap. 4, p. 267. Accord to the Catholic Church, the proof of their power to change God’s Sabbath day, rest in the fact that the Protestants have accepted Sunday as their day of worship. 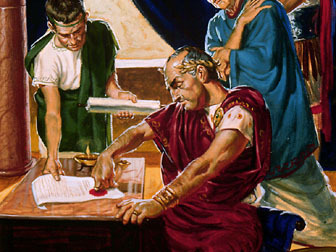 Catholics say, “Had she not such power, she could not have done that in which all modern religionists agree with her;–she could not have substituted the observance of Sunday the first day of the week, for the observance of Saturday the seventh day, a change for which there is no Scriptural authority.”—Stephen Keenan, A Doctrinal Catechism (3rd ed. ), p. 174. “The Lord’s day did not succeed in the place of the Sabbath, but Sabbath was wholly abrogated, and the Lord’s day was merely of ecclesiastical institution. It was not introduced by virtue of the fourth commandment. – Jeremy Taylor, D.D. (Church of England), Ductor Dubitantium, part 1, book 2, chapter 2, secs. 51 (1851 ed. ), vol. 9, p. 458. “I Affirm that the first day of the week, or Sunday, as we call it, is not commanded by the Lord Jesus or his apostles, to be observed as a holy day, on which, as on the Jewish Sabbath, no work should be done.” Jas. R. Lithgow, The Sabbath Question as Originally Published in the “Acadian Recorder”, (1861), p. 12, chapter 2. “Take the matter of Sunday, there is no passage telling Christians to keep the day, or to transfer the Jewish Sabbath to that day” – Harris Franklin Rail, Christian Advocate, July 2, 1942. “Why do we worship on Sunday? Doesn’t the Bible teach us that Saturday should be the Lord’s Day? Apparently we will have to seek the answer from some other source than the New Testament.” — The Pentecostal Evangel, David A. Womack, Aug. 9, 1959, No. 2361, p.3. “The sabbath, which represented the completion of the first creation, has been replaced by Sunday which recalls the new creation inaugurated by the Resurrection of Church.” — Catechism of the Catholic Church, part 3, section 2, chapter 1, article 3, 2190. “For as often as ye eat this _________ and _______ this cup, ye do shew the Lord’s death till He come” (1 Cor. 11:26). © Copyright 2015 - David M. Ephraim, Touch of Faith Ministry. All Rights Reserved.